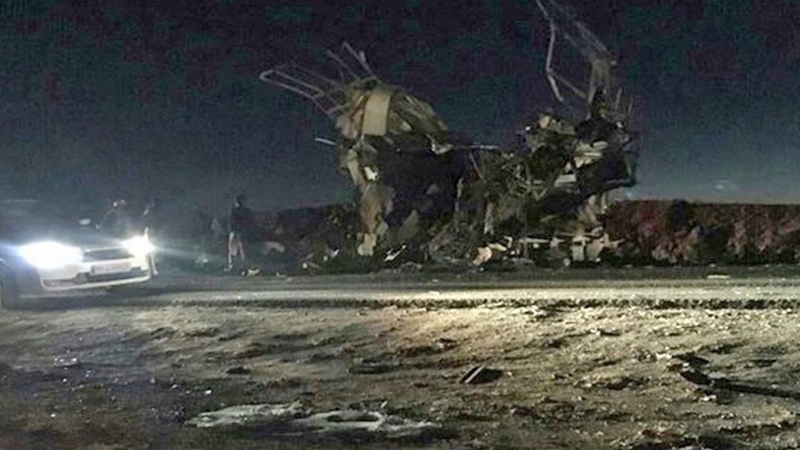 Iranian President Hassan Rouhani has condemned the suicide bombing in the country’s Sistan-Baluchestan province, and vowed to punish the “criminal mercenaries” who carried out the attack that killed 27 members of the elite Revolutionary Guard. “Without a doubt, all perpetrators and those who ordered this vicious, flagrant act will be punished soon with the hard work of the powerful security forces of the country,” Rouhani said in a statement published in his website on Thursday. He also said that the attack on Wednesday night is “another shame in the dark history of the main sponsors of terrorism”, drawing a link between the incident and actions by the US, Israel and their “regional agents” against Iran. In a separate statement before leaving for the Russian city of Sochi, Rouhani was also quoted by IRNA news agency as saying that Tehran will make those responsible for the deadly incident “pay for the blood of our martyrs”. On Thursday, Ahmad Ali Mouhebati, governor general of Sistan-Baluchestan, which borders Pakistan, declared three days of mourning period in honour of the victims. Bahram Ghasemi, spokesman of the Foreign Ministry, also issued a statement saying the attack will be “avenged soon”. “The self-sacrificing Iranian military and intelligence personnel will take revenge for the martyrs of this incident,” Ghasemi said on Thursday. Earlier, Iranian Foreign Minister Mohammad Javad Zarif said that “it is no coincidence” that his country was hit on the same day that the US held a summit in Poland, which is seen as aimed at countering Iran. “US seems to always make the same wrong choices, but expect different results,” he wrote on social media on Wednesday shortly after the attack. The armed group Jaish al-Adl (Army of Justice) has claimed responsibility for the attack, which also left dozens of other Revolutionary Guard members injured. Abas Aslani, a visiting scholar at the Centre for Middle East Strategic Studies in Tehran, said that Jaish al-Adl is an offshoot of the armed group, Jundallah, whose leader Abdolmalek Rigi was captured and executed by Iran in 2010. He said the new armed group is “supported and sponsored” by Saudi Arabia, to carry out attacks inside Iran, its regional rival. Jaish al-Adl and its affiliate groups based in neighbouring Pakistan have been accused of committing cross-border attacks against Iranian forces. Aslani said that the attack demonstrates the “contradiction” of what Saudi Arabia and its ally the US are doing in the Polish capital, Warsaw, and what is happening on the ground in the Middle East. “In Warsaw, the slogan is the fight against terrorism, and the effort to bring stability to the region. But here in the region, something else is happening,” he said, pointing to the deadly incident last night. Aslani said he expects a swift response from the government against those who are responsible, but added that Tehran “will not apply the same approach” as its enemies, and will not be baited into an escalation of violence. Fateme Karimkhan, a Tehran-based journalist, said there is a brewing anger among ordinary Iranians following Wednesday’s attack, which she said targets “very young” soldiers serving their compulsory military service “in very dangerous situation”. The attack also hurts the local population in Sistan-Baluchestan, which is trying to introduce the area as a tourism destination as a way to help reduce poverty in the region, she said, while laying part of the blame on neighbouring Pakistan, which shares a porous border with Iran. “The repetition of this kind of attacks are increasing recently, and the government in Pakistan is doing nothing about this terroristic groups which attacks Iran’s soldiers and go back to Pakistan,” she added. Karimkhan predicted that Iran’s military will not stay quiet on the issue, hinting at more pressure on the Pakistani government. In recent months, the Sistan-Baluchestan area has seen several attacks including a suicide car bombing in the port city of Chabahar in December, which left four police officers dead and 42 other people wounded. Jaish al-Adl is also accused of abducting members of the Revolutionary Guard in the Sistan-Baluchestan border with Pakistan in October 2018. In December 2010, an estimated 41 people were also killed and 90 others were wounded after a suicide attack near a mosque also in Chabahar. At least 29 people, many of them Revolutionary Guard draftees, were killed in Ahvaz in September during a military parade commemorating the end of the Iran-Iraq War in 1988.